The Top 10 Tips For Successful Street Photography You Need to Know! Learn New Skills. Advance Your Photography. 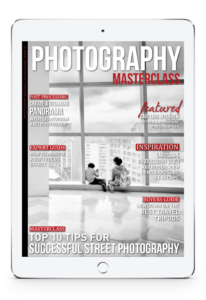 The Top 10 Tips For Successful Street Photography You Need to Know in This Issue of Photography Masterclass Magazine! Street photography is a spontaneous form of photography, that's about capturing human life and a snapshot in time on the streets. For a lot of photographers it can be a daunting genre of photography to master because of the psychological task of capturing candid photos of strangers without their permission. So how best should you approach street photography and what camera settings and techniques should you use? In our masterclass in this issue we go in-depth into the top 10 tips you should master to become a successful street photographer. – Landscape photographer Kevin Roberts goes on location showing how he photographed a long exposure seascape in an inspirational video tutorial. – In our expert guide, Jo Plumridge explains exactly how to achieve a soft focus effect in your images to give them a soft glowing atmosphere. – We interview action & adventure photographer, Dave Lehl, whose ability to focus on capturing intimate moments has allowed him to forge successful collaborations with brands like Mountain Dew and Oakley. – We feature a handpicked selection of our favourite photos in our Editor's Choice section. – You'll learn how to create a stunning panorama using Lightroom and Photoshop in a great video tutorial. – We showcase an amazing timelapse that captures the beauty and drama of storm chasing at its best! For the last few years, Mike Olbinski has made it his mission to chase and capture the biggest storms of the year and this year is not exception! – We give you the lowdown on the best travel tripods to take with you on your next trip. Get All This and More In A Content Packed Issue! Get A Free Trial Subscription Now! "Streaming Video Lessons & Comprehensive Tutorials To Learn New Skills & Advance Your Photography!" Click The Button Below To Grab A Free 14 Day Trial Subscription, And Download The Latest Issue For Free Now!